Being someone who loves to takes photos and document everything, I have to stay organized or I will go insane. 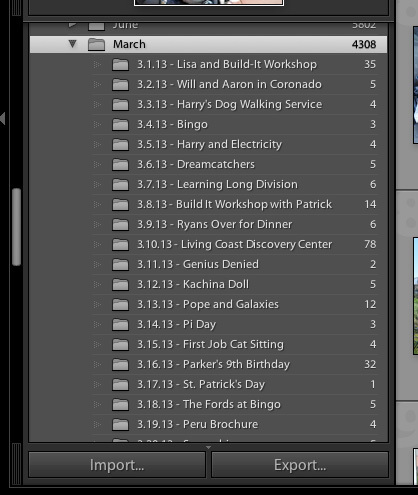 After various attempts with numerous programs, I think I am finally at the right place – Adobe Lightroom. It does everything I need it do (and a little more). Now everyone has a different system to organize their photos and I have certainly spent hours upon hours researching the best solution. Wedding photographers organize by weddings, baby and family photographers tend to organize by client, but how do ordinary people organize? After many attempts at consolidation by event, date, people, place I finally resolved that organzing by date is the only way to go for me. First I organize by year. I have scans back from my birth and beyond. Within each year I organize by month. And within each month is the date followed by a title (or brief description) of the day. I “keyword” everything so I can search my photos by specific people, events, places and/or details and then create a “collection” of these photos for photo books, projects, etc. 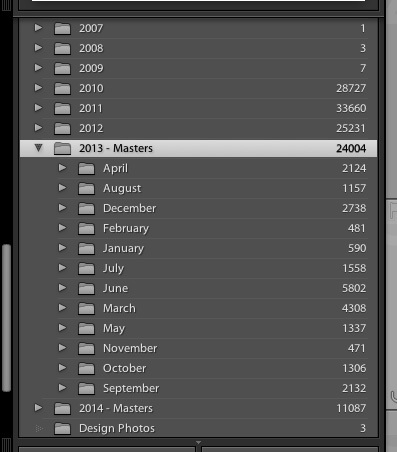 Now I have been documenting our lives every day for the past 5 years and that is A LOT of photos. I am currently at around 200,000. There is no way I could keep all those on my computer or even half without my computer crashing, so I use external hard drives. And not only are they all stored on the external hard drives, I am also currently using CrashPlan for my external back up of my hardrives. You can never have enough back up!! 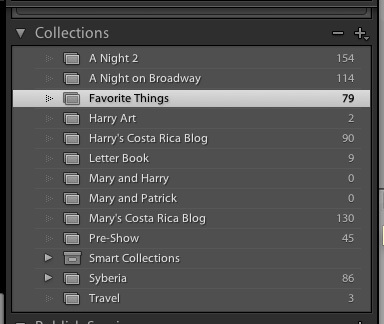 Whatever you do, stay sane and find a path towards the zen of photograph organization. This entry was posted in Adobe Lightroom, organization, photography and tagged Adobe Lightroom, organization, photography by mabufive. Bookmark the permalink. Right now I hate Lightroom.. I was importing directly and then I tried to change the name of the folder and you know what happens then. Or if you don’t, let me tell you. 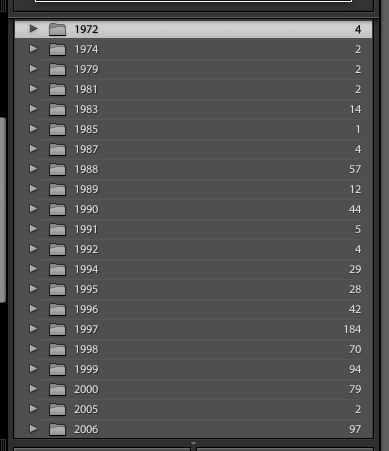 Lightroom can’t find your photos. I am taking a step back from Lightroom right now. I have a skype consult with Mary Lou set up for sometime in the near future. Hopefully it will help. I am about to lose my mind over this! Boy do I need some lessons on the Zen of photography!!! Working on this very issue right now! Obviously need to delve deeper!! I have even had a consult with Marilou and am still at square one!!! I do however have the external hard drive and crashplan!